Our meet your town official series featured Town of Greenwich Director of Environmental Affairs, Patricia Sesto. 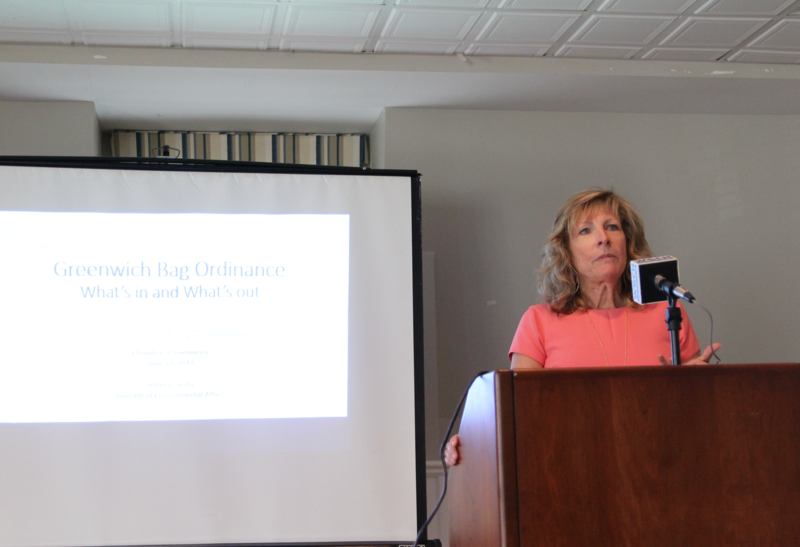 She provided updates and important information in our "What You Need to Know About the Check Out Bag Initiative” community meeting on June 11 at the Greenwich Water Club. Below is a recap from Greenwich Free Press. Please comment to this post with your questions and feedback. On Monday morning Greenwich’s Director of Environmental Affairs Patricia Sesto gave a talk organized by the Greenwich Chamber of Commerce at the Greenwich Water Club. Sesto, who now leads both the Conservation Commission and the Inland Wetlands and Watercourses Agency, said she inherited the implementation of the ordinance banning plastic bags, which goes into effect on September 12, 2018, but that she fully supports it. “I had nothing to do with having this ordinance passed, but I am very pleased,” she said. Sesto said the ban addresses the damage done to the ocean and Long Island Sound by plastic bags, which not only don’t decompose, but kill wildlife that interprets the plastic as food and die when it gets stuck in their intestines. She said micro plastic particles outnumber plankton six to one, and that toxins adhere to micro plastics and enter the food chain, where they are ultimately ingested by people. She said floatables ensnare, suffocate and cause internal damage to wildlife. It’s not just an environmental issue. The plastic are disruptors of the endocrine and reproductive systems, infertility and are a possibly linked to some cancers. Further, she said the ban acknowledges that aquaculture is the largest area of farming in the state, spanning 60,000 acres. “We need to protect this as an economic asset,” she said. Also, she said plastic bags jam up the recycling machinery and mostly are not allowed in the recyclable stream. In addition plastic bags clog up sewage treatment plants and storm sewers. Enforcing the Ban. Sesto said the Conservation Commission is tasked with enforcement of the ban, and that at first, a warning will be issued. A second incident will result in a$150 fine, and subsequent fines will be $250. To give local businesses a heads-up, Sesto said the Town is in the process of sending a mailing to 2,700 local businesses detailing the ordinance and its implementation. Also, she said high school students are delivering flyers throughout town. “History has shown that this change can be made smoothly and efficiently, and that 40 communities in Massachusetts have done it with minimal enforcement. “The best enforcers are customers,” Sesto said. After Sesto’s presentation, the audience of about 20 gave feedback and asked questions. Clare Kilgallen said that families accompany their children to the first day of school in the fall, and that might be an opportunity to give away reusable bags and incentivize families. She also suggested adding information about the ordinance to the tax bills, but Sesto said unfortunately the dates did not coincide. Laura Gladstone of Fiscal Freedom for CT, formerly known as Fiscal Femmes, pressed Sesto for details on the costs of implementing the ordinance, asking exactly how much the mailing to retailers will cost. Sesto said she did not have the exact figure, but would find out. Gladstone, who has been a vocal opponent of the ban, calling it a “nanny tax” and a “regressive tax on low income residents,” asked Sesto if she was aware that some grocery stores already take the plastic bags back. In response, Sesto acknowledged that to be true, but the extent they’re recycled is questionable, and that even if the stores recycle them, it’s as little as 1% to 3% that are recycled. Lastly, Gladstone asked who would report violations to the Conservation Commission. “So people walk around and tell on other people? That’s nice,” Gladstone said. Gladstone said her group has heard complaints from local businesses upset about the upcoming ban. In fact, what Sesto did say was in response to a comment from a woman who said she’d been in California and Florida where bans on plastic straws are growing. Sesto said on average in the US, people use 300 bags each, and that 18 million bags are being used a year in Greenwich. She said that volunteers with BYO Greenwich worked hard over about 18 months to get approvals including the RTM who passed the ordinance in March 2018, albeit with no fee. “The high school students said this is our tomorrow and plastic bags don’t have a place in it,” Sesto said, referring to about 40 students who turned out with posters and spoke in favor of the ordinance at the RTM meeting. Sesto said Greenwich is far from unique in banning plastic bags. “We are not ahead of the curve. In the US alone, there are 49 million people who live where plastic bags are banned,” she said, adding that Nantucket was the first town to ban plastic bags back in 1990, San Francisco was the first city to ban plastic bags in 2007, and California was the first state to ban plastic bags in 2014. Westport was the first town in Connecticut and until now, the only town to ban plastic bags, which it did back in 2009. Mary Shaw Marks, a member of BYOGreenwich reminded Sesto that the ordinance has a three year sunset clause. “We’ll need hard numbers including current distribution of plastic bags and paper in order to evaluate. Only the town can ask for that. We tried but we’re not getting a lot of feedback,” Marks said. “It would be important to ask for that now and again in three years. My suspicion is there will be a wholesale transition from plastic bags to paper bags, which was not the intent. A fee would have made all the difference,” she said referring to the RTM vote which declined a 10¢ fee in favor of no fee. Who is impacted? Sesto said all business establishments are impacted, with no exceptions: food retailers, clothing retailers, festivals and craft fair vendors, liquor stores, doctors and dentists, restaurants, food delivery/food trucks, hardware stores, and farmers markets. “If you put it in a bag to give to a customer, you’re included,” she said, adding that even a doggie bag from a restaurant can no longer be plastic. Reusable Checkout Bag defined. A bag is considerable if it is able to carry 22 lbs 125 over a distance of at least 75 ft, and be made from plastic, has a minimum thickness of 12 mil. Paper bags defined. Paper bags must contain no old growth fiber and have a minimum of 40% post consumer recycled content. They must be 100% recyclable and have printed in a highly visible manner on the bag the words “Reusable” and “Recyclable” in addition to the name and location of the manufacturer and the percentage of post-consumer recycled content. Product bags are exempt. Sesto explained exemptions include dry cleaner bags, produce bags that hold fresh fruits and vegetables or bags that hold or wrap fresh or frozen meat or fish, flowers, potted plants, unwrapped prepared foods or bakery goods, packages of multiple bags for use as garbage, pet waste or yard waste, and plastic newspaper sleeves. One of the Chamber’s missions is to be a conduit between the business person and Town Government. We are pleased to collaborate with Town Hall for these community presentations.